Espresso brings out the rich dark chocolate flavour in this one-bowl brownie recipe. For a double chocolate hit we have glazed these brownies with a simple, easy-to-make chocolate glaze. Microwave 4 oz. chocolate and butter in large microwaveable bowl on HIGH 2 min. or until butter is melted; stir until chocolate is melted and mixture is well blended. Stir in sugar. Blend in eggs, coffee and vanilla. Add flour and nuts; mix well. Pour into prepared pan. Bake 30 to 32 min. or until toothpick inserted in centre comes out with fudgy crumbs (do not over bake). Cool completely. Microwave remaining chocolate and Cool Whip in microwaveable bowl on HIGH 1-1/2 to 2 min. or until glaze is smooth, stirring every 30 seconds. Pour over brownies. Refrigerate 15 min. or until glaze is set. Use foil handles to remove brownies from pan before cutting into 1-inch squares. Microwave 1 oz. Baker’s White Chocolate in microwaveable bowl on MEDIUM 1 min., stir until melted and smooth. Spoon melted chocolate into a plastic bag. Using scissors, cut a tiny hole in the corner of the bag. 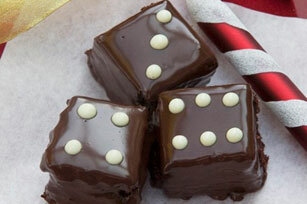 Top each brownie square with dots for a domino pattern decoration.